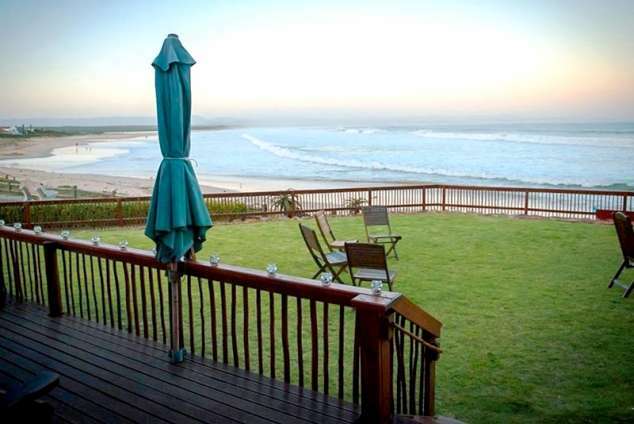 Jeffrey's Bay Beach House - Jeffreys Bay Accommodation. If you’re looking for the perfect accommodation in Jeffrey's Bay, look no fur­ther. Jeffrey's Bay Beach House is a bed and break­fast establishment situ­ated right on the beach in one of the world’s greatest towns. With the beach greeting you whenever you step out the door, you can expect a relaxed, tranquil atmosphere at our B&B. Our rooms are stylishly dec­or­ated, two en-suites and two with detached private bathrooms. Breakfast is served daily between eight and ten in the morn­ing, and lunch is available upon request. Help yourself to a delicious cup of tea or coffee in our communal lounge. Business clientele can enjoy access to our free Wi-Fi network, and perhaps take a long relaxing stroll on one of our pristine beaches. Take a seat on our deck, sun-downer in hand, and enjoy watching surfers carve into the Albatross surf spot’s waves, or fishermen patiently waiting for the big one to bite. Our rooms are stylishly decorated each with its own private detached or en-suite bathrooms, as well as bathroom amenities. A ceiling fan, satellite TV, a safe and daily housekeeping is among the conveniences offered. The Backpackers Room has two bunk beds and partially open bathroom with a shower. The private kitchenette is equipped with a mini fridge, microwave and kettle. A television with satellite, fan and complimentary Wi-Fi are among the conveniences offered. One of South Africa’s most famous surf spots, Supertubes home to the yearly Billabong Pro contest. There are plenty of incredible locations to choose from within the Jeffreys Bay area. In exquisite surroundings of indigenous coastal vegetation and a pristine beach, enjoy riding our well-schooled, good-natured horses. 685 page views since 07 Aug, 2018.